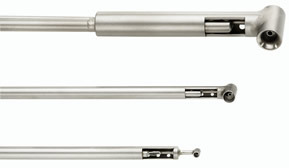 Kiel Combination Pressure and Temperature Probes | United Sensor Corp.
KT: Special purpose Kiel - Temperature Probe measures total pressure and temperature in one unit. The Kiel Head is insensitive to pitch and yaw angles of flow up to +/- 45°. Thermocouple has grounded junction with bleed holes. Exposed and ungrounded junctions are available. Thermocouple accessories and pressure connectors are also available upon request. Please consult United Sensor.